Many Apple Music subscribers are looking for a way to enjoy their favorite Apple Music songs via a web browser instead of using iTunes at work because iTunes are not allowed to install on working computers. In this article, we will show you several ways to enjoy your favorite Apple Music songs via a web browser. However, we need TuneMobie Apple Music Converter to convert Apple Music tracks to MP3 or M4A first. Many Apple Music subscribers would like to work with Apple Music on. However, it’s known to all, many companies do not allow to install irrelevant software on working computer because it may bring unnecessary trouble. Overstaffed as iTunes on Windows may be in the block list as well. Using a smart phone or tablet may also distract them from work. So many Apple Music subscribers want an Apple Music web player or they are looking for a way to enjoy Apple Music songs using a web browser instead of iTunes. You may Apple Music web player is a demand of small crowd, but in fact, you can count it as a public demand as we show you some evidence below. “How do I listen to Apple Music via my web browser? "Will they ever release a Web Player? “Will Apple Music ever get a Spotify-style web interface? Some Apple Music subscribers also plan to give up Apple Music and switch to Spotify as Spotify provides a Spotify web player to help their users to enjoy Spotify music via a web browser. Here we provide a solution for you to enjoy Apple music using a web browser like Chrome. All we need is TuneMobie Apple Music Converter you can use to convert Apple Music songs to MP3 or M4A which can be played without iTunes as well as supported by most modern web browsers. After converting Apple Music to MP3 or M4A, we have several ways to enjoy the tracks using a web browser like Chrome, Firefox, Microsoft Edge, Safari, Opera, etc. TuneMobie Apple Music Converter is the best solution to help you enjoy your favorite Apple Music songs without using iTunes on PC or Mac, it can also help you enjoy them on iPod Nano, iPod Shuffle, PSP or any other MP3 players as well as web browsers. Below are the wonderful features of TuneMobie Apple Music Converter. The premise of enjoying Apple Music songs using a web browser is to convert Apple Music songs to MP3 or M4A, so you may be interested in the following guides. Now, let’s see how to use web browsers to enjoy Apple Music songs after conversion. 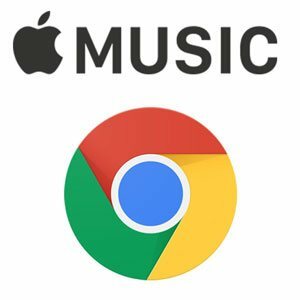 To use Google Chrome to enjoy the MP3 or M4A songs converted from Apple Music, you can take advantage of Chrome apps or extensions. You can search music player or some other keywords in Chrome Web Store. Here we use app “Enjoy Music Player” as example. Once installed, you can open chrome://apps/ and click Enjoy Music Player to launch the app. Then click “Add Music” button and click “Add/Edit location” button to set your music folders. 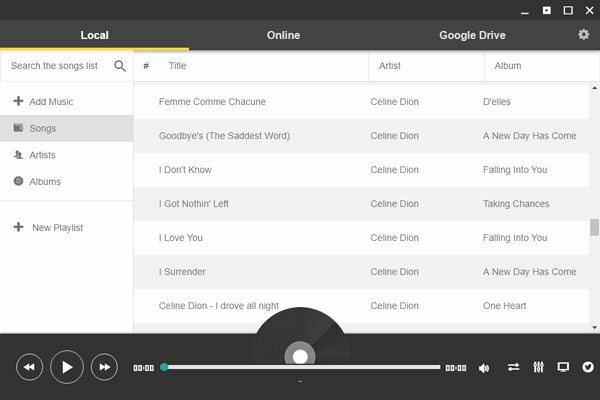 “Enjoy Music Player” also allows you to play music by artist and album, create playlists and use Sequence, Repeat One and Shuffle playback modes. If you prefer Chrome extension, you may try “Local Media Player”, but it only provides a Choose button for you to select a local song. Actually, you can also directly drag and drop a song to Google Chrome or other web browser, however, it’s inconvenient and costs more time on operation, and won’t never help you concentrate on working. You need to click Play button again to repeat. You can’t play multiple songs or create a playlist in this way. “Local Music Player” add-on for Firefox used to be a good choice, however, it hasn’t been updated for some time and isn’t compatible with latest Firefox. However, if you are using an old version of Firefox, you may still try it. You can also create a photo slideshow with your favorite songs as background music, then upload to YouTube or other video sharing websites. However, YouTube or similar websites may detect copyright problems and won’t allow you to upload. If you are familiar with HTML5 and CSS3 and running an independent website, you can upload the songs and use HTML5 codes to build a web page including a playlist of your songs converted from Apple Music. In our opinion, Apple will never release a web player for Apple Music because they do think iTunes can do everything for you. Anyway, after converting Apple Music songs to MP3 or M4A, you can avoid using overstaffed iTunes and use Windows Media Player, VLC Media Player, KMPlayer, Winamp or any other media players you like.